“Even in his youth Kamrana Josen had never been one to enjoy the easy life of the Concord – volunteering for exploration service in his twenties and taking part in armed missions to Tars Urgon, in the De’el campaign, and on the astreroid colonies of Ulk’ka G’neka. When the Vorl broke the seal of Aan Four in the Seventh Segment War, Josen was selected as one of the first Concord Commanders to lead troops into the old Aan Shard since it was plunged into thermo-plasmic chaos five centuries earlier. Josen’s company was in the first wave to make planet fall. He decided to land his ship darkside on Aan Four’s western continent to avoid contact with Vorl patrols. It was an unlucky choice – because only hours before the Vorl had managed to repopulate the planet’s sensors using remnant nano-spore. A heavily armed Vorl AG unit intercepted Commander Josen’s company. Casualties began to mount. Before the first shot had been fired the Vorl threw a local suppression-shield around the area, making it impossible to get a message to the other Concord troops in the east. Josen’s company found itself pinned down by Vorl dug-in to the surrounding hills. As explosive plugs hammered into the rocky gully where they had taken refuge, Josen ordered his tech-support team to rig an overpowered hyper-light shield small enough for him to carry. Then, with the shield jury rigged to his battle armour, bandoliers of plasma micro-grenades, and his plasma carbine in his left hand, he launched himself at the nearest Vorl combat group. Exploding plugs ricocheted from his armoured shield, but soon he reached the terrified Vorl, shooting three grenades into the dugout where they were cringing, before finishing off the survivors with the carbine. Unfortunately, the blast of his own plasma grenades had been enough to blow out Josen’s battlesuit’s blackout visor, but this did not deter him from advancing upon the second Vorl position. Despite suffering hits to his legs, Josen staggered towards the target, and once again a hail of plasma grenades struck the enemy position. He was so close that he was badly burned from the blast of his own grenades, and – thanks to the malfunctioning visor – practically blinded. Whilst his troops could only watch in amazement, Josen limped towards the final Vorl position, where the alien engineer with the suppression shield generator was cowering beside the Vorl Commander. With his battle armour’s sensors tuned to the acrid scent of the transgenic Vorl, Josen staggered into a hail of exploding plugs, relying upon his hyper-light shield to deflect most of the shots as he came with range of the grenade dispenser. Having seen what had already happened to their friends, most of the Vorl threw down their weapons and ran for it. Three more grenades soon reduced the shield generator to molten metal and the Vorl Commander to a bubbling smear of gelatinous goo, also melting off Josen’s right hand in the blast. 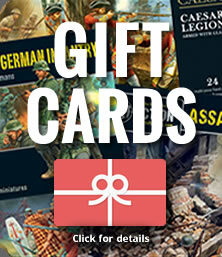 Substitute your army commander with this heroic Antarean character! 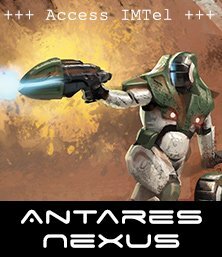 Commander Kamrana Josen has been modelled based on the incident on ‘Aan Four’, with bandoliers of grenades and HL armour with jury rigged boosters (these have been given options listed on page 229 of the Beyond the Gates of Antares rule book). Strike Squads form the core of the Concord Combined Command’s armed forces wherever they are deployed. 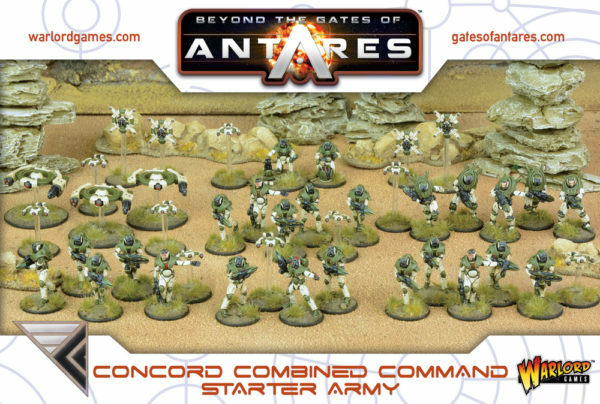 Today they receive reinforcements as the new plastic Troopers are now available separately from the Xilos Horizon Box Set for all C3 Commanders. Strike Troopers are amongst the best-equipped fighters in all of Antarean space. They carry multi-function plasma carbines capable of punching a hole through most armour or shooting rapid bursts of deadly plasma bolts. 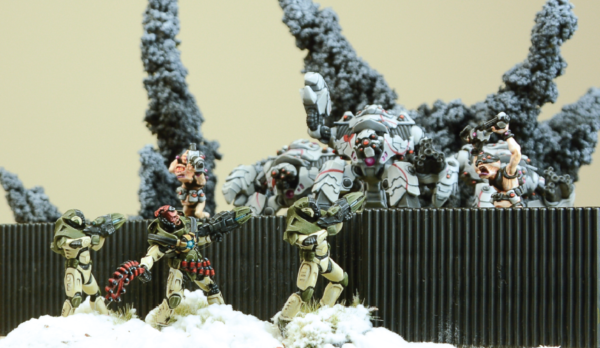 Strike Troopers are protected by invisible hyperlight armour suspended from the nano-cored casing of their battle suits. This advanced armour provides complete atmospheric isolation as well as effective shielding against enemy weapons. Strike units are often accompanied by small buddy drones, such as spotter drones that act as the unit’s ‘eye in the sky’ feeding vital targeting information into the squad’s sophisticated combat shard. 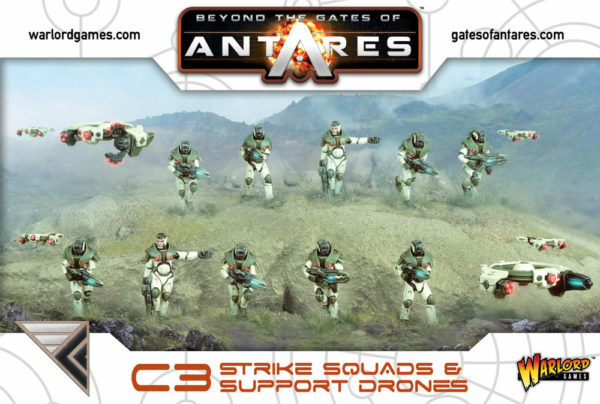 Strike formations are often accompanied y units of C3D1 Light Support Drones. These lightly built drones are self-sufficient fighting machines that are ideally suited to the mobile support role. They are armed with plasma light support weapons, which are easily capable of dealing with even relatively well-protected targets. Although not as heavily armoured as larger drones, their composite skin and reactive kinetic shields enable them to withstand hits from most light arms. 2 C3 Strike Squads. 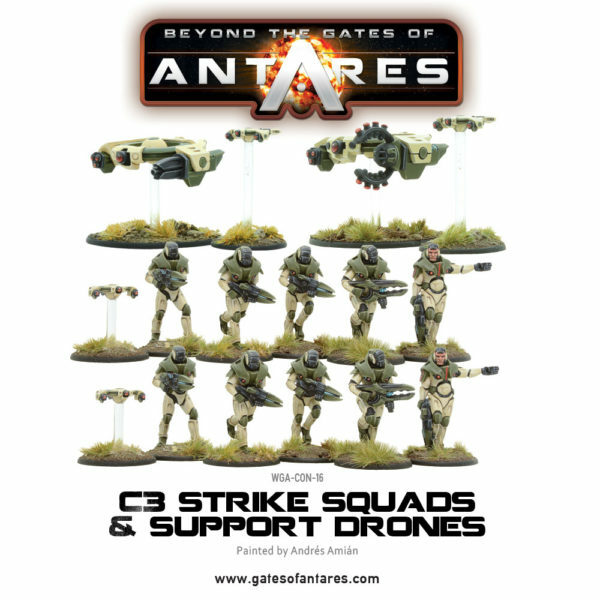 Each squad includes Squad leader with plasma carbine and x-sling, 4 C3 Strike Squad Troopers with plasma carbines (1 may be upgraded to a plasma lance) and 1 spotter drone. 2 C3D1 Light Support Drones with plasma light support or subverter matrix and 2 C3 Spotter Drones. 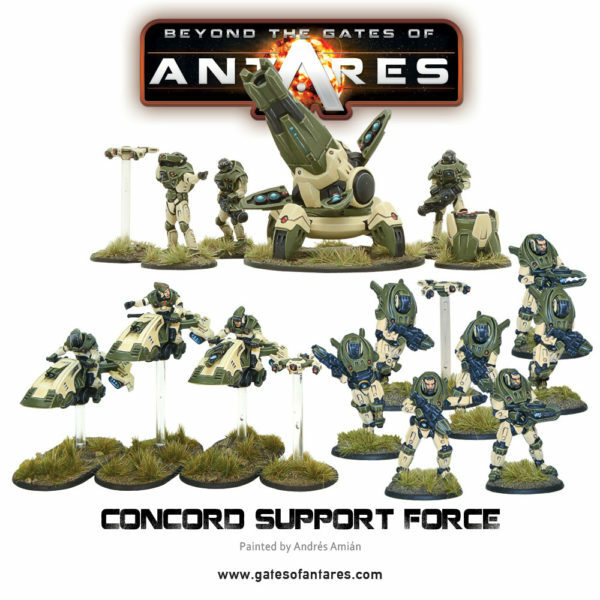 Perfect additions to any growing army, these add to the fantastic range of Concord choices including the new Support force that gives you enough to add to your Combined Command Starter Army to easily reach a large game size 1500 point Offensive army and beyond!